133885070 –For courses in Money and Banking or General Economics. Readers learn best when they see concepts applied to examples from their everyday lives. 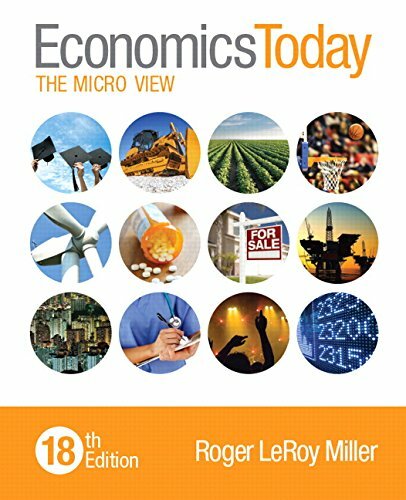 The Eighteenth Edition of Economics Today: The Micro View addresses leading-edge issues while facilitating reader learning. The text shows readers how economics is front and center in their daily routines while providing them with many ways to evaluate their understanding of key concepts covered in each chapter. New and revised tools and features engage readers and help them focus on the central ideas in economics today. Note: You are purchasing a standalone product; MyEconLab does not come packaged with this content. If you would like to purchase both the physical text and MyEcon search for ISBN-10: 0134004647 / ISBN-13: 9780134004648 The Micro View Plus MyEconLab with Pearson eText — Access Card Package, 18/e. That package includes ISBN-10: 0133885070 / ISBN-13: 9780133885071 Economics Today: The Micro View, 18/e and ISBN-10: 0133916677 / ISBN-13: 9780133916676 MyEconLab with Pearson eText — Access Card — for Economics Today: The Micro View, 18/e. MyEconLab should only be purchased when required by an instructor.